The future of commercial surface cleaning, turning any dusting tool into an easy-to-use, high-quality dusting appliance. 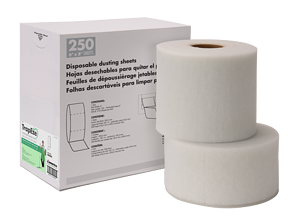 A single-ply, double-sided, disposable, adhesive-coated dusting cloth manufactured to conveniently fit current dusting sheet tools. A patent pending product is constructed of non-woven fibers which are externally coated on both sides with a propriety adhesive material that removes dust and dirt without leaving a sticky residue behind. This product can be used on all hard surface flooring, baseboards, moldings, ceiling fans, bookshelves, cabinets, radiators, lamp shades and more. Perforated sheets fit a variety of tools including conventional dust mops, handheld dusters or cleaning by hand. Low drag promotes increased productivity. Plus, double-sided sheets go twice as far. Traps and holds dust, dirt, sand and hair for unsurpassed cleaning results. Place under your current holder or conveniently fit under any dust mop. 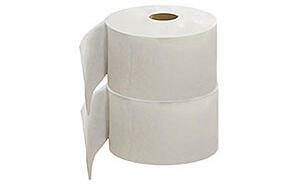 Tear off perforated sheet to fit your cleaning tool. Place sheet under cleaning tool and you are ready to clean. Periodically check cloth during use and flip to clean side once loaded. Ideal for cleaning hard surface floors and high or hard to reach areas. 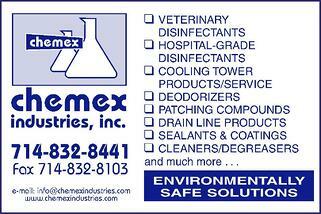 Dispose of cleaning sheets after use.